Caterpillar launched its LatchFree Dipper System at MINExpo 2016 in Las Vegas, offering a solution to the most common causes of rope shovel downtime – the latch assembly. The Cat LatchFree Dipper System replaces the standard latch assembly with a durable steel link assembly mounted to the dipper back. The key to the design is the geometry of the locking mechanism. The arrangement makes it possible to locate the components away from the abrasive flow of material. The system has been designed and field proven for a service interval of 3000 hrs, as compared to the standard system that requires adjustment as often as each shift. In addition to delivering greater uptime and lower maintenance costs, the system eliminates false trips – unplanned release of the dipper door – caused by dirt buildup or the need for shim adjustments. The result is fewer delays, consistent production and lower cost per tonne. 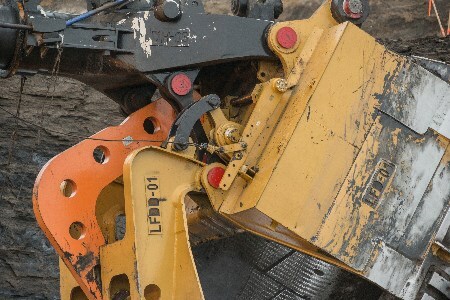 The LatchFree Dipper System is currently available for Cat electric rope shovels with dipper capacities of as large as 49 m3 for 7495 Series shovels that meet machine configuration requirements. The system proved its performance on a Cat 7495 HF loading Cat 797 trucks in the challenging oil sands of Alberta, Canada, but would also be cost effective in coal applications running big Cat shovels – such as those in the Power River Basin in the US.